Alien VoIP with Window allows you to communicate over internet with desktops,notebooks and others. You can make cheap VoIP calls anywhere and anytime with access to the internet via Wi-Fi or over 3G/4G. Besides, you can manage your phone call easily in office or on the road by using your laptop or laptop tablets. AlienVoIP users can make calls from anyplace where there is high-speed Internet access. Users can use their laptops or window tablets to make call to their business partners or colleagues anywhere. Using AlienVoIP technology is cost-efficiency and you can save cost in your phone bills. You are only need to invest in high quality internet and you can make VoIP callas within Malaysia or to International Countries anytime. 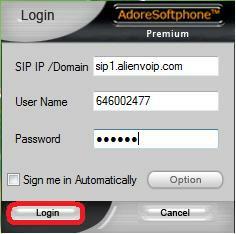 Adore SIP Softphone comes with an intuitive Graphical User Interface and can be easily customized. It’s designed with SIP technology that can be used to make outbound phone calls from PC to telephone. Since SIP softphone uses Microsoft’s g723.1 codec, it can be used in all versions of Microsoft Windows without the need of external codecs and gives excellent call quality even in dial-up connection. You can download and install from Adobe Premium Website. Get a AlienVoIP SIP account with one of the validated SIP Providers and use the Adore SIP Client to start making and receiving calls all around the world. Enjoy our lowest AlienVoIP call rate right now! 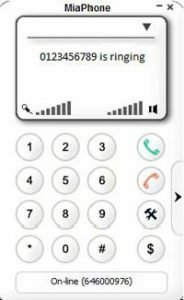 MiaPhone is a free SIP-based softphone, which can be used to make or receive calls through Internet.It is compatible with all Voip (Voice over IP) service providers, that support SIP protocol.The main feature is Miaphone compatible with Windows 98/Me/2000/XP/2003/Vista/7. On the other hand, Miaphone also supports SIP outbound proxy and it register with SIP registrar. Hurry up! Get a AlienVoIP SIP account with one of the validated SIP Providers and use the MiaPhone SIP Client to start making and receiving calls all around the world. Enjoy our lowest AlienVoIP call rate right now! 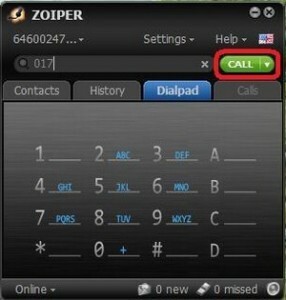 Zoiper Softphone is compatible with most VoIP service providers and PBX’s. Zoiper enables the user to make and receive calls though multiple SIP and IAX accounts and lines while confident in the security of your conversation. Moreover, Zoiper softphone make and receive voice calls with supreme quality, which also can transfer and hold calls. You can download and install from Zoiper website. Get a AlienVoIP SIP account with one of the validated SIP Providers and use the Zoiper SIP Client to start making and receiving calls all around the world. Enjoy our lowest AlienVoIP call rate right now!